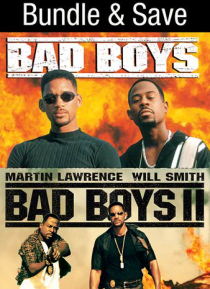 Bad Boys: Miami cops Will Smith and Martin Lawrence are two loose cannons who tear up the Sunshine State in search of stolen drugs. Co-starring Tea Leoni. Explosive direction by Michael Bay (Armageddon). Bad Boys II: The action and comedy never stop when superstars Martin Lawrence and Will Smith reunite as out-of-control trash-talking buddy cops. Bullets fly, cars crash, and laughs explode as they… pursue a whacked-out drug lord from the streets of Miami to the barrios of Cuba.